Holidu! The world's biggest meta-search engine for vacation rentals. It was founded in 2014 and I joined in 2016 as the first full-time designer. Since then, I helped the team launch three new products, double our conversion rate on the Holidu website, quadruple our headcount and recruit and lead a team of 5 designers. 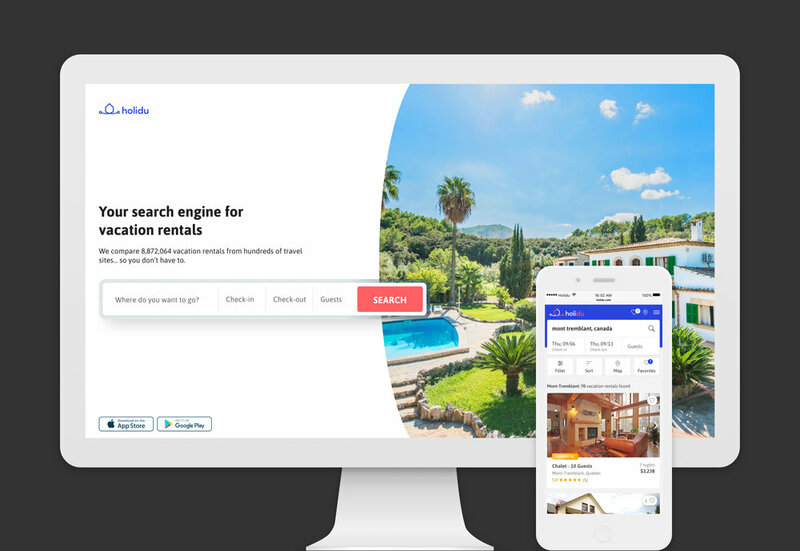 For consumers: The inventory of vacation homes is fragmented across hundreds of partners such as Booking.com, Airbnb, HomeAway etc... Properties can be found on different platforms with different availability and pricing, making the search and booking of properties cumbersome and exhausting. For tech: Meta-search is complex. The influx of data structures is fragmented and miss-aligned, requirements across partners are widely different and pricing and availability requests are not standardised. The barrier to entry is low and competition is fierce. Design and build a reliable and trustworthy product that makes it easy for travelers to find and book a matching vacation home. As a lead designer at Holidu, I lead the design across all platforms including web and apps. I help the team conduct the user research we need to make informed design decisions and help rebrand Holidu's identity as we go through hyper growth. Research is a key component in informing decision making. When I first joined Holidu, I wanted to establish a culture of research and user-centricity. We needed to understand our user's expectations, pain points and needs. I first set-out by conducting 21 users interviews from different backgrounds, age groups and gender and collected feedback from all main stakeholders. There was an overwhelming sense of lack in trust and the data supported it. Since then, all features are designed to remove fear, increase trust and help confirm the user's choice. We also extensively work with User Testing to collect feedback on new features and regularly meet with our users to validate the direction of the product as it evolves. Archetypes were extracted from the user research to help our teams understand who our users are. Research showed us the way we have to take to improve. But we were still missing a vision that binds the product team together. In summer 2017, the design team worked with the founders to envision what the product should look like as we moved forward. We explored a new brand direction, investigated new interaction models and defined design principles and a design language for the new Holidu website and app. As the team grew bigger, we started slowing down. The team leads decided to try splitting the teams in two, creating two squads with each having a distinct part of the user journey to focus on. Every squad had a dedicated designer, frontend and backend developers and a product manager. In the new setup our velocity increased and surpassed our previous record. We rebuilt the new product from scratch and launched it. We then conducted a new round of in-person user interviews. All main pain points were resolved with the exception of one: The users wanted to stay on Holidu and not get redirected to partners pages. We are now working with the business development team to see how we can accelerate this process. Meta-search products are inherently difficult to build a cohesive experience for. The complexity in the data structures and variations and contracts across partners go against unification and standardisation. Yet people see value in them since there is no alternative out there. Stay in touch for further updates and thanks for reading. Nelson is an app concept that counts the number of words you speak every day and helps you improve your vocabulary! Nelson is an app concept that I discovered when the HR manager told me that we won't be proceeding with a candidate because she spoke at least 5 times more than the average person. That peaked my curiosity and I wondered how many words I speak per day. I told a friend of mine - who is a developer - about the idea and he thought that it could be a fun project to try out. As my friend assessed the technical feasibility of the project, I started fiddling around with values, brand and UX. The brand values I picked were: Curiosity, Progress and Playfulness. I then defined the attributes and formal aesthetic codes for each value and created a mood board for each. I find this process to be very valuable in grounding the project. From that point on I started working on the logo. The logo I settled for matched the values while being quiet unique in it's aesthetic. Theoretically speaking, we had a tone of ideas about the benefits and value of the concept. Practically though, it would have simply not been feasible to respect the user's privacy or their battery's life. For more info, do not hesitate to get in touch. Farmers struggle with decision making when it comes to the application of pesticides on their crops. Leverage technology, data and field insights to provide farmers with the necessary tools to make informed decision about pesticide applications, grow healthier crops and increase their revenue. I was responsible for interaction design, research visual design support and prototyping. In 2015, I had the chance to work with one of the world's largest agrochemical companies to help them figure out how to help farmers make better decisions. The project started with a concept phase where we prototyped a concept based on stakeholder interviews. The next step was to visit farms around the world to assess the concept's success. I joined the team during the user testing phase in France to help with the research and partake in the final design refinement phase of the project. The main challenge we were trying to solve was to understand how a system can help farmers improve their crop applications. In order for such a system to work, it has to act as a recommendation engine that takes into account a myriad of data points and events. The system needs to consider: historic data, satellite and drone imagery, soil & biomass maps, seed types, plant data and growth stages, pest and disease pressure, insecticide applications and weather data. Most farmers we spoke to collect this data on a regular basis. The main problem is that they couldn't make sense out of it over time and couldn't relate it to each other. The obvious solution would therefore be to create a unifying system that gathers all the data in one place and allows the user to analyse it to make better decisions. During the in-field research the team realised that the click-through prototype that was shown to users contained features that were based on wrong assumptions. The concept design had to be thoroughly revisited. When the team was back from the research, I proposed to start with drawing the user journey. A farmer's typical season consists of 5 main phases: Pre-seeding, seeding, application, harvest and post harvest. During every one of these phases users make decisions based on a set of parameters they collect from different sources. The user journey was therefore used to analyse which type of parameters farmers need and how they can be brought together within one solution to facilitate better decision making. After the user journey I put together the experience model. Without a system that learns, the data remains static and non-personal. Learnability is foundational in the operation of the system. Once a recommendation is proposed to the farmer, they have a chance to accept it or deny it. Since the system cannot initially have as much information about the farmer's own fields, a feedback loop is created. With time, the system's recommendations should get smarter and more specifically tailored to the user. The team then worked closely with the client to identify the most suitable content structure. The main screen would be a map view of the farm and all it's fields. From there, the user can either access the map view of a specific field or access the time-based view of all fields. Notifications of crop protection applications take the user to the time based view of a specific field from which they can access the crop application details. Once the content structure was established, we split the work. I was responsible for the "action" screens which show the user a time-based view of their farm as well as a specific field. At the farm view level, the fields are categorised by crop type. The user can also change the scale view. On the left is the seasonal view where the user can have an overview of all past and upcoming crop applications as well as access their scouting trips. On the right a weekly view is shown from which the user can access their applications. 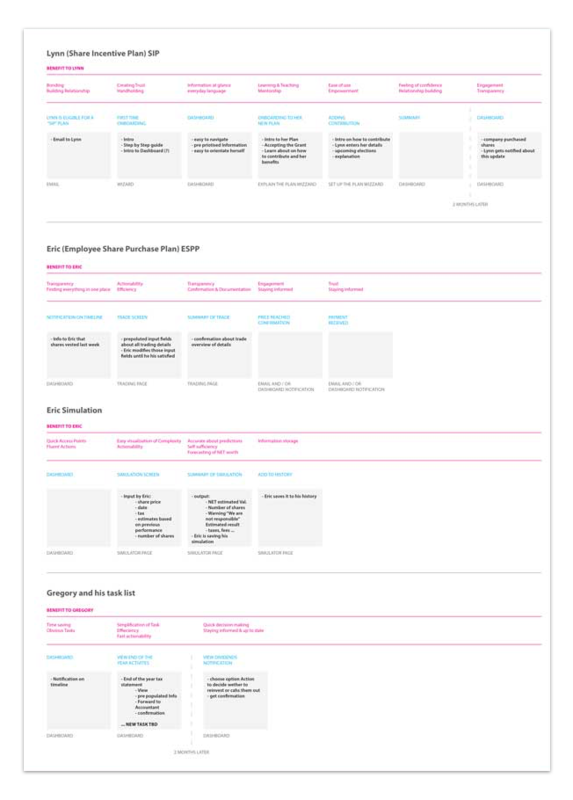 Fields that have upcoming applications are shown at the top of the category. A summary of their applications is displayed right below them. The left screen shows how a user is notified about a weather alert that conflicts with their application. In tis case, if the application date is not modified the fungicide application will loose it's effect. It must not get rained on for 3 to 5 days after the application. The right screen shows a time-based field view. This is the most granular stage the user can get to in the application. Weather data, disease pressure and all predictable parameters are superposed for the user to see data in context while making a decision. The screens below show how the wireframes were translated to visual design. I worked closely with the visual designer to ensure that the hierarchy and contrast between different components was clear. These compositions show the field view at the farm and field level. I supported in the final refinement of the screens to help meet our deadline. The team had 3 weeks in total after the research for research synthesis and concept re-design. In B2B products the product team can craft truly unique experiences. The way businesses are different from consumers is that they have a vested interest in the success of the supplier. It is therefore a lot easier to meet, talk and learn about the business needs & requirements and craft a wonderful experience. Although this project was mainly conceptual (without development), it was one of the most exciting projects I've worked on. I wish the farmers the best of luck moving forward. Do not hesitate to get in touch to learn more. Rate my wait was a design exercise proposed by a company I applied for. While there are many ways to rate and review restaurants, these are not focused on evaluating individuals servers. I took on the challenge to design an experience where diners can submit positive comments and constructive suggestions for the wait staff, and servers can use this feedback to both improve and help to secure new employment. The documentation on this page gives an overview of the process I followed. Step 1: Breaking down the problem. 1. After giving the task some thought and researching similar solutions in the market, I identified 4 different directions to solve the problem. I analysed the pros and cons of each as well as the implication each solution has on customers, servers and restaurant owners. You can find the details of the initial thought process in Appendix A: Initial thoughts at the bottom of this page. 2. I chose the direction that would be the most impactful in solving the problem. 3. I started sketching out the main key flows I would like to create. 3. I wireframed my main screens then researched the visual direction I would like my design to follow. Early research with the cats. RaitMyWait is a web app that allows customers to review servers by simply taping an NFC tag available at the dining table. The review is then added to the server's profile and can be browsed by anyone who has access to the platform. I created the product's homepage to set the communication's tone of voice. This helped me add clarity to the value proposition and clearly define the scope of the product. I took a mobile-first approach. Towards the end of the wireframing process I crafted my visual design artefacts. In the next step I created the signup flow. I wanted the flow to be clear, straightforward and easy. Once the user signed up and completed their profile, they can start receiving customer reviews. Others can also view their profile and message them. When a dining customer taps on the NFC tag with their phone, they are instantly redirected to the rating page. I finally refined the experience model diagram that I had initially sketched by hand. This exercise was done over the course of a week during my free time. It was a lot of fun and could be a viable product in the market once NFC sensors are integrated into the majority of phones.